Bonesupport has developed CERAMENT, an innovative injectable bioceramic bone void filler with unique bone remodelling and drug eluting properties. CERAMENT targets a $1.7bn US/$450m EU5 market and has shown rapid sales growth (33% CAGR 2014-2017), albeit from a low base. Bonesupport is focused on exploiting this opportunity through sharp commercial execution (including through its own direct US sales presence). In an increasingly commoditised orthopaedics market clinical data is key; Bonesupport has a data-driven strategy to accelerate penetration into existing and broader indications. New data should highlight CERAMENT’s benefits vs alternatives, support reimbursement, and show a positive impact on hospital costs. We initiate coverage with a SEK1,325m (SEK26/share) valuation. Leveraging a unique platform CERAMENT has proven ability to remodel into host bone within 6-12 months, completely fill voids, and elute drugs; all important bone graft attributes. It is clinically and commercially validated with three CERAMENT products available in Europe, a basic bone void filler (BVF, also sold in the US) and two drug eluting versions (G and V). With an addressable market opportunity of c650k bone void procedures annually (US/EU5), and limitations associated with available treatment options, there is significant scope for organic growth. Filling the gaps in evidence Compelling clinical data is key to providing competitive differentiation for CERAMENT, supporting premium pricing and reimbursement, and capturing market share. Two key trials represent important inflection points. Data from CERTiFy (non-inferiority vs gold standard autograft) due in H218, should accelerate global CERAMENT BVF trauma sales. 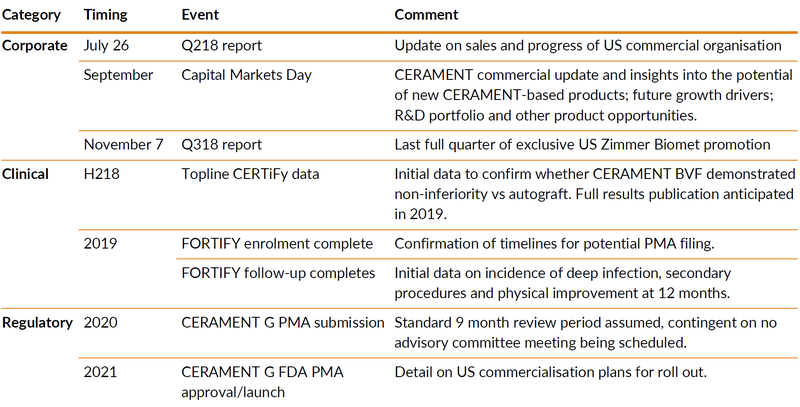 While FORTIFY (US registration trial) will support a 2020 FDA filing of high-margin antibiotic-eluting CERAMENT G.
A commercial foundation for growth Strong European sales growth (38.1% CAGR 2014-17) driven by increasing CERAMENT G/V adoption resulted in FY17 sales of SEK51.2m. Recent US sales growth (30.5% CAGR 2014-17: SEK78.1m FY17 sales) has been impacted by supply chain issues post-merger of distributor Biomet with Zimmer. In May 2018, Bonesupport terminated this agreement. From October 20, it will sell direct in the US via a network of 18 independent distributors. Launches of synergistic products (currently sought) and CERAMENT G (in 2021) will leverage this new commercial platform, transforming US profitability in the medium-term. DCF model indicates valuation of SEK26/share We value Bonesupport using a three-phase DCF (explicit 5 year forecasts to 2022, a 10 year trending period and 2.5% terminal growth rate) applying a 12.5% discount rate. Our model generates a value of SEK1.325bn ($152m) or SEK26/share, with upside potential from strategic execution. Shares are trading near post-IPO lows with significant catalysts ahead, including CERTiFy data and the anticipated US sales acceleration. What is CERAMENT and how is it used? Bonesupport is a Swedish orthobiologics company founded in 1999 by Prof. Lars Lidgen (Lund University) to commercialise his research in orthopaedics, bone and joint infections. Its key focus is on the development and commercialisation of CERAMENT, a proprietary platform of radiopaque injectable bioceramic products with unique bone remodelling and drug-eluting properties. CERAMENT is clinically validated and has been used to treat more than 35,000 patients to date. Three products (CERAMENT BVF, the basic bone void filler, and CERAMENT G and V which elute the antibiotics gentamicin and vancomycin) are marketed directly by Bonesupport in key European countries (UK, Germany, Switzerland, Sweden and Denmark). From October 2018, Bonesupport will market CERAMENT BVF direct in the US (currently sold by Zimmer Biomet). Global sales growth has been strong, albeit from a low base, with significant opportunity for further penetration into the large and growing bone void filler market. In tandem, Bonesupport intends to leverage its new US commercial platform and broaden its product portfolio globally, making the transition from a one-platform company to leadership in orthobiologics. Bonesupport completed a Nasdaq OMX Stockholm IPO in June 2017, raising SEK500m (gross) at SEK29/share (with a further SEK59m via over-allotment). It is headquartered in Lund; at end-2017 it had 64 employees (18 in R&D; 33 in sales). Our three-stage DCF valuation methodology generates a SEK1.325bn ($152m) or SEK26/share valuation for Bonesupport. We explicitly model sales of currently available CERAMENT products in Europe and the US (and US sales of CERAMENT G with a 75% risk adjustment) to 2022, followed by a ten-year trending period, with a 2.5% terminal growth rate. Individual product NPVs are summed and netted against operating costs. We apply a 12.5% discount rate to be conservative as it is a small company operating in a highly competitive market; a 10% discount rate increases our valuation to SEK2,031m ($234m) or SEK40/share. Bonesupport is well funded for strategic execution (Q118 cash: SEK397m). The impact of CERTiFy data and commercial initiatives, coupled to delivery under the new direct US sales model, should accelerate global CERAMENT BVF sales from FY19 (2017-20 CAGR of 23.6%). Continued European CERAMENT G/V traction (36.0% 2017-20 CAGR) supports an c86% overall gross margin, ahead of potential CERAMENT G US launch in 2021. Profitability should be reached in FY21. Bonesupport operates in a competitive, increasingly commoditised orthopaedics market, where all players face continuing pricing pressures. Its strategy is to grow sales through commercial execution and seek differentiation through sustained investment in robust industry-leading clinical data, healthcare outcomes research, and marketing to raise CERAMENT’s profile and market share. Strong data is needed to support reimbursement and, for CERAMENT G, US approval assuming a positive outcome from the FORTIFY trial. Near term, CERAMENT BVF growth will be influenced by impact of CERTiFy data on driving global adoption in trauma and the performance of the new US direct sales platform. Bonesupport has a unique product platform in its injectable bioceramic bone void filler CERAMENT. Its current product portfolio includes a basic bone filler (BVF) and two antibiotic-eluting fillers (G and V) and is gaining traction globally with sales CAGR of 33% (2014-17). This rapid growth is from a low base, which given the addressable market, means significant potential for growth and share capture remains. Commercial execution and a data-focused strategy are central to fully exploiting this opportunity. Bonesupport is generating evidence that CERAMENT improves clinical outcomes in various settings, with a cost benefit, to provide compelling rationale for improved reimbursement and broader use in treatment and management of bone voids. In the US, it is also shifting to a higher margin direct sales model. We initiate with a SEK1,325m (SEK26/share) valuation. CERAMENT has proven ability to heal bone defects by remodelling to host bone within 6-12 months and can locally deliver drugs/biologics into bone voids. It closely resembles human bone and optimally balances the role of scaffold with resorption, creating the conditions and space for new bone growth. CERAMENT G and V have additional benefits: lowering infection risk and hospital readmission. CERAMENT has been commercially validated in three products (all sold in Europe; only CERAMENT BVF in the US), with positive sales momentum in all regions (2014-17 CAGR of 38% [Europe], 30% [US]) until recent post-merger supply chain disruption at US distributor Zimmer Biomet. Bonesupport terminated this contract in May 2018 and will begin direct marketing in the US from October, laying the foundations for a profitable US business to support the anticipated 2021 launch of CERAMENT G. It intends to further leverage this US infrastructure and broaden its global product portfolio, to catalyse the transition from a single-platform company to a leading orthobiologics player. Bonesupport is also focused on generating the necessary clinical data to target the wider synthetic bone substitute opportunity with CERAMENT. June 2017 IPO proceeds (SEK516m net) are being invested in commercial infrastructure, clinical studies and healthcare outcomes research. Clinical data will provide important differentiation, support reimbursement, and strengthen CERAMENT’s competitive position in a commoditised orthopaedics market with mounting cost pressures. Execution on the strategic growth priorities, under new CEO Emil Billbäck (who joined in March 2018) is vital in realising CERAMENT’s full potential. Bonesupport is targeting commercial investment into existing markets, leveraging the growing body of clinical data to increase adoption across broad indications and to pursue improved reimbursement. Near-term, CERTiFy trauma data (due H218) will be an important driver of global CERAMENT BVF sales. Beyond 2020, regulatory catalysts come to the fore. CERAMENT G should be the first FDA-approved injectable ceramic antibiotic-eluting bone void filler (assuming positive FORTIFY data and 2021 PMA approval). The next wave of CERAMENT-based pipeline candidates could also approach the market. CERAMENT G is a high margin product with the potential to catalyse a step-change in Bonesupport’s revenues and margins following US launch. This is validated by the European 2014-17 CAGR of 42.5% for CERAMENT G/V (vs 38% for total Europe sales). CERAMENT is a proprietary platform of injectable mouldable bioceramic products indicated for the filling of bone gaps and voids not intrinsic to the stability of the bone structure. It has two differentiating properties vs other synthetic bone void fillers: the clinically proven ability to remodel into host bone within 6-12 months, and the ability to elute drugs directly into the bone void. CERAMENT consists of a blend of 40% hydroxyapatite (HA) and 60% α-calcium sulphate hemihydrate powder in a ratio designed to balance the rates of implant resorption and of new bone in-growth to optimise the healing of the bone defect. HA is highly osteoconductive and acts as a long-term scaffold to support bone in-growth, while calcium sulphate provides structural support but is resorbed more quickly so creates space for the new bone tissue to grow. Bone in-growth following CERAMENT use is shown below in preclinical models (Exhibit 1), with full resorption within one year demonstrated in a clinical case study following an osteotomy (surgical cut to the bone to allow realignment) after a distal radius fracture (Exhibit 2). CERAMENT is supplied in an easy to use, sterile, closed-system mixing device (Exhibit 3) which can be used at room temperature. It is highly injectable enabling narrow needles to be used, facilitating the filling of small voids as well as the entirety of larger voids. Setting is isothermic (no danger of thermal injury to surrounding tissue) and occurs in 15 minutes, after which time CERAMENT can be drilled, an important claim for trauma surgery. It also includes a liquid component, iohexol, which is radiopaque, therefore enabling it to be used in both minimally invasive and open surgery procedures where fluoroscopy is used (eg filling voids following bone cyst or bone tumour removal). This provides a point of differentiation as the market moves towards the goal of reducing surgical time (and total cost of care) while delivering improved patient outcomes and a more replicable standard of care. CERAMENT is bone graft substitute used by orthopaedic surgeons to fill bone voids or bone defects. Small bone defects may not require a graft to facilitate healing. But, in cases where there are multiple or complex fractures following trauma, meaningful bone loss due to disease (osteoporosis, cancer) or infection, or a need to promote healing following related surgery (implant replacement), bone grafts are necessary. The goal of a bone graft is to help regenerate bone, with the bone substitute being resorbed and replaced by new mature bone over time. Osteogenesis: synthesis of new bone by living bone cells (osteoblasts) originating from the bone graft material, derived either from patients (autograft) or donors (allograft). Osteoconduction: implanted scaffold provides passive support for bone formation via ingrowth of bone cells (osteoblasts and osteoclasts) which, over time, replace the scaffold with new bone. Osteoinduction: exogenous growth factors (eg bone morphogenetic proteins) promote mesenchymal stem cell differentiation into new bone forming cells. CERAMENT is a commercial product platform which has been on the market for some time. Three CERAMENT products are currently commercially available (Exhibit 4). The first to be launched, CERAMENT BVF (bone void filler), sold in the US since 2005 and Europe since 2009, is marketed directly by Bonesupport in five European countries (UK, Germany, Switzerland, Sweden and Denmark) and through speciality distributors in 8 other non-US countries. In the US it has been distributed by Zimmer Biomet since 2012; this deal ends in October 2018, when Bonesupport begins selling direct. Two antibiotic-eluting products, CERAMENT G (gentamicin) and CERAMENT V (vancomycin), are also sold in Europe. Exhibit 5 illustrates how sales are gaining traction (33% CAGR 2014-2017), especially in Europe (with short-term issues in the US) albeit from a relatively low base in the context of the overall bone void filler market. This suggests there is ample opportunity for a unique product such as CERAMENT to capture share in a large and growing market where unmet need persists. Source: Bonesupport Note: CERAMENT BVF also available in Canada, India, Malaysia, Oman and Singapore; CERAMENT G also available in India, Malaysia and Oman; CERAMENT V also available in Malaysia and Oman. The global bone graft and substitutes market is large and growing. Reports from Grand View Research, Global Industry Analysts and GlobalData estimate it is currently worth c$2.5bn (excluding autograft) and expected to reach c$3.6bn by 2024. Regionally, Asia Pacific is expected to show the fastest growth, although North America is forecast to remain the largest, and most profitable, market. The US is currently valued at c$1.7bn, with the EU5 at c$450m. Increasing demand for bone grafts stems from a rise in bone-related disorders largely due to population growth and a demographic shift towards an aging population (increased prevalence of osteoporosis, arthritis and other bone disorders as well as a rise in joint reconstruction surgeries), coupled with increased incidence of sports injuries in younger age groups. Market growth is also being catalysed by newer technologies – particularly grafts which promote healing – and compatibility with minimally invasive surgery as orthopaedics companies seek to differentiate themselves, particularly from a health economics standpoint. A background of growing cost pressures has led to rising commoditisation. Pricing pressure from both buyers and payors, changing reimbursement scenarios, biocompatibility concerns, product recalls due to manufacturing issues, and a lack of skilled surgeons are important constraints on market growth. Nevertheless, safe and effective repair of fractures and bone defects remains an area of unmet medical need. Bone grafts and substitutes are used in a variety of applications, which have different healing characteristics that determine the relative difficulty of forming new bone. Orthopaedic surgeons also have a choice of products at their disposal, which differ with respect to efficacy, cost, and patient morbidity. Autograft accounts for around a third of procedures in Europe (where synthetics have a similar share, followed closely by allografts), but c20% in the US, where DBM (demineralised bone matrix) is preferred in a third of procedures, although the rest of the market is more evenly split. Autograft (patient derived bone) has long been considered the gold standard bone graft, with high efficacy and safety, although its limitations mean that use has declined over time. These include the requirement for two surgical procedures (harvest, typically from the iliac crest, and then the transplant itself), which increases its cost vs the alternatives, is painful, and is associated with infection risk. Additionally, the graft material is inherently limited in supply and of variable quality, and a trade-off needs to be made between structural support (cortical bone derived) and osteoinductive cellular material (cancellous bone). Allograft, or donor derived bone tissue, avoids the main drawbacks of autograft harvest (donor site morbidity, increased surgery time), but is associated with its own risks. These include cost and potential for infection, rejection and disease transmission. DBM, a highly processed form of allograft bone, avoids this latter risk. It consists of the collagen matrix from the allograft (obtained through acidic extraction), containing proteins and growth factors which confer varied properties; however, given it lacks the inorganic mineral component, DBM has limited mechanical strength. 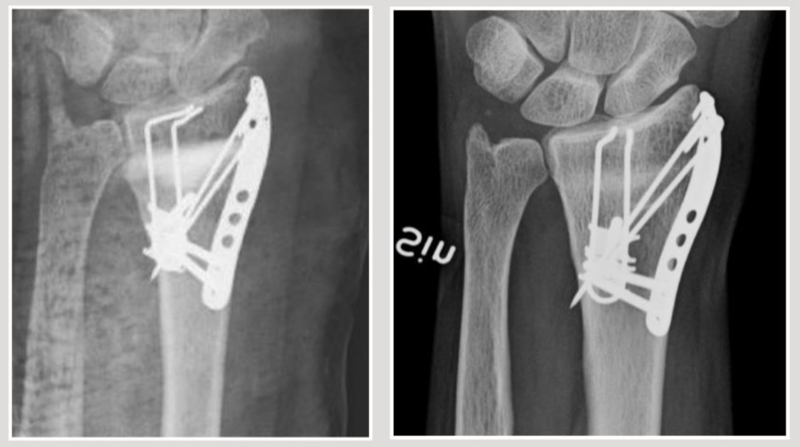 Synthetic bone substitutes have been developed to overcome the disadvantages of autograft and allograft, but with a broadly comparable outcome with respect to bone healing. Synthetics are sterile, inexpensive, provide an osteoconductive scaffold and are easily processed and handled. All synthetic substitutes have highly reproducible properties, but each type has differing mechanical and physical characteristics depending on its composition (mineral or ceramic) and format (granules, paste, putty), and clinical evidence to date is limited. CERAMENT BVF competes directly with several synthetic bone void fillers (Exhibit 6) in a current addressable market of c650,000 procedures (US and EU5) annually. Most synthetics are FDA 510(k) cleared as a bone void filler for applications not intrinsic to the stability of the bony structure. Source: Trinity Delta, Company websites Note: * Number one bone substitute by global sales, >600k implantations (as of 2014). The physical and mechanical characteristics of bone substitutes are designed to closely replicate that of human bone, and as such graft composition is an important determinant of how successful it is in promoting bone healing. The vital characteristics of this healing are filler resorption and bone remodelling (with full integration with existing bone). By mass, human bone is 60-70% hydroxyapatite (HA), a form of calcium phosphate, hence calcium salts are the primary components of bone substitutes. Two main compounds (calcium sulphate and calcium phosphate) form the basis of available bone void fillers; each confer differing properties and lie at opposite ends of the spectrum with respect to resorption. Calcium sulphate: Resorbs quickly, no bone remodelling. Resorption rate is faster than bone growth (6-12 weeks), so it is unable to act as a scaffold or provide long-term mechanical support. The result is that insufficient bone tissue will regenerate prior to resorption, leaving a gap between the implant and new bone, delaying bone healing (potential for fracture or fibrous tissue interposition). Other limitations: brittleness, potential inflammatory reaction, and temperature sensitivity (for setting). Advantages: biocompatible; suitable drug carrier due to dissolution rate. Calcium phosphate: Resorbs too slowly, very slow remodelling. Rate of resorption (years) is slower than bone growth, which coupled with limited porosity means bone in-growth is obstructed, instead occurring through creeping substitution. Other limitations: implant density means it may be stronger than the surrounding bone and with limited flex, there is risk of stress shielding (reduction in bone density) and delayed fractures at the interface. Advantages: biocompatible; provides structural support; depending on chemical structure and processing resorption can be slow (sintered hydroxyapatite: 10+ years) or more rapid (ß-tricalcium phosphate: 6-18 months; amorphous hydroxyapatite: 6-12 months). Remodels to patient’s own bone: provides a resorbable osteoconductive scaffold to support growth of new bone cells. Depending on the size of the bone void, full integration occurs within 6-12 months. Complete filling of bone voids: injectable and flowable material which ensures no small spaces remain where tissue fluid/blood can accumulate, or bacteria grow, reducing the risk of delayed healing and subsequent infection or fracture. Drug eluting capabilities: CERAMENT G and V demonstrate protection of bone healing through local delivery of antibiotics at a therapeutic level over a sustained period to kill infection-causing bacteria. CERAMENT is pH neutral and so does not interfere with antibiotic activity. A pipeline of other drug eluting products (including of osteoinductive therapies) is under evaluation. Other important characteristics of CERAMENT include: injectability and radiopacity (facilitating use in minimally invasive surgery), isothermic setting (no tissue damage through heat production), and ease of use. To best address both current CERAMENT demand and be optimally positioned to exploit future market opportunities, Bonesupport is investing in its commercial infrastructure. It intends to ‘bring a sharper focus and execution’ to its strategy. The recent announcement that Bonesupport is replacing US distribution partner Zimmer Biomet with its own network of independent distributors, and expanding its US commercial organisation, is a major step in this respect. We discuss the rationale behind, and implications of this shift, in US operations later in our report. Marketing, training, and education initiatives with surgeons and key opinion leaders. The goal is to strengthen understanding of CERAMENT’s unique properties and ability to improve clinical outcomes, and convert this into increasing use. Initiatives could include more frequent seminars such as the March 2018 Nordic Expert Meeting on Bone Infection, the largest Bonesupport event to-date with c80 surgeons in attendance. In Europe, Bonesupport currently has a 20-strong commercial organisation (including senior management) and is directly responsible for sales of all three CERAMENT products in 5 countries (representing c80% of European sales). It has announced plans to recruit a further 13 sales reps during 2018 to increase the penetration of CERAMENT G and V in particular. 8 additional countries are accessed by distributors. During H217, two new distributors were secured: a second distributor for Italy (Citieffe, which generated first sales at 3 of the top 20 regional trauma centres during Q118) and Novomedics in France, responsible for the first French sales in late-2017. In the US, 14 Bonesupport employees support Zimmer Biomet, which has held exclusive North American marketing rights to CERAMENT BVF since 2012 (through a deal initially struck with Biomet). Issues connected to post-merger integration following the 2015 c$14bn acquisition of Biomet by Zimmer have negatively impacted sales of CERAMENT BVF for the past three quarters. While remedial steps to resolve its issues are being taken by the new Zimmer Biomet CEO, there is no firm guidance on how long the process will ultimately take. This uncertainty is one reason for Bonesupport’s strategic transition to a direct sales model in the US from October 2018. A second, more important reason is to have a fully operational US commercial platform ahead of 2021 CERAMENT G launch. During 2018, Bonesupport is strengthening and expanding its existing US sales organisation to 23 FTEs (from 14), opening a Boston office, and recruiting the first 18 independent distributors by year-end. This new commercial set-up removes the doubt surrounding when US CERAMENT BVF sales return to growth and should benefit Bonesupport financially, by enabling retention of a higher margin. It also provides the company with greater influence over distribution channels and end-user sales than at present. The intention is to leverage existing relationships with key stakeholders (surgeons, hospitals and payors), as well as boost brand recognition (though product education and direct marketing), to enhance penetration across key orthopaedic indications. A priority for Bonesupport is securing reimbursement and driving penetration in both existing (ie predominantly chronic osteomyelitis in Europe and revision arthroplasty in the US) and new clinical settings (focusing initially on the large trauma market). This will be achieved through building CERAMENT’s clinical data package, by conducting post-marketing trials to provide level 1 evidence, contributing to trial registries (eg Baltic Fracture Competence Centre (BFCC) project), and case study reports. During 2017 Bonesupport implemented changes to its US commercial organisation to increase regional and local product focus and sales follow through as well as to generate post-marketing clinical data in the US, and peer-reviewed publications from US key opinion leaders. Additionally, Bonesupport is evaluating near-to-mid-term external opportunities to expand its global offering by adding complementary product lines – either through outright product acquisitions or strategic partnerships. We consider bolt-on osteobiologic product acquisitions for commercialisation through its direct salesforce in Europe and the US. In addition, Bonesupport is likely to secure new distribution partners for new regions (eg the high growth Asian market) as being most likely. We note that the registration process for CERAMENT BVF and G has been initiated in Australia, with potential for approval by end-2019. Bonesupport already has evidence to support the utility of CERAMENT and its positioning vs alternatives, but robust clinical data is required to provide clearer differentiation for surgeons and payers. Data from post-marketing trials will be used to leverage CERAMENT’s superior competitive positioning vs standard of care or in specific indications to drive increased usage of its products by KOLs and larger orthopaedic trauma centres. This will have trickle down effects by driving increased adoption in smaller units. 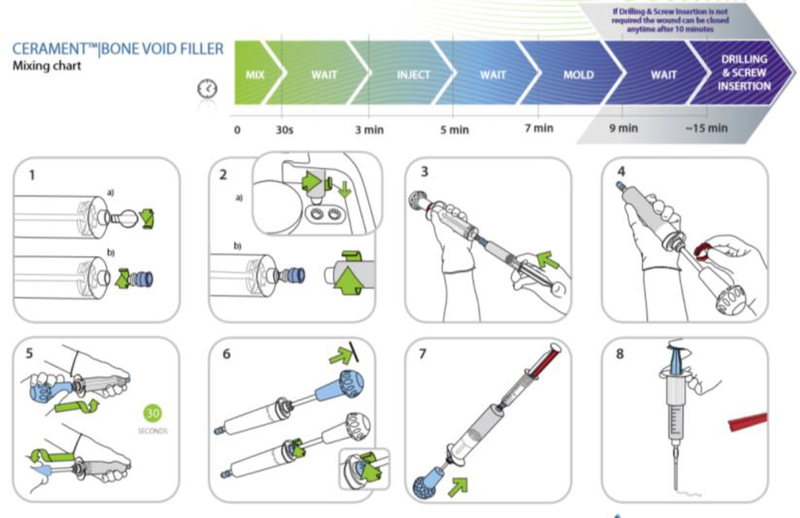 There is broad availability of different types of bone void fillers, with product choice largely determined by the indication/medical need addressed, clinical outcome, economics and the preference of the surgeon. The importance of and requirement for clinical evidence is not as extensive as in pharma/biotech. However, it is becoming an increasingly prominent contributor to the marketing and reimbursement of med-tech products (illustrated by Exhibit 7 above), especially as companies seek premium pricing for their innovative products in a competitive and increasingly commoditised market. As an inpatient orthopaedic product, CERAMENT is usually reimbursed via a case payment system such as DRG (diagnosis related group). This is essentially a reimbursement system whereby a hospital receives a fixed bundled payment (based on average treatment cost) per patient to cover all costs associated with diagnosis and treatment, rather than separate sums for each product or procedure used. Exhibit 8 provides an overview of the inputs into a typical DRG. Under DRG, hospital profitability can be increased by balancing resource allocation with optimal patient outcomes. Thus Bonesupport, through its HEOR (healthcare economics outcomes research), seeks to gather evidence that use of CERAMENT results in improved treatment outcomes in a variety of indications. Positive outcomes from these trials will support future pricing/reimbursement discussions in key markets. In turn, improved reimbursement could lead to expansion of Bonesupport’s direct sales footprint (resulting in higher margins). The US and many European countries have DRG systems, albeit with subtle differences, especially in relation to their treatment of higher priced procedures or products such as CERAMENT G/V. These are often funded directly from hospital budgets prior to receipt of reimbursement coding as an add-on to DRG. CERAMENT G and V are premium priced products with an average end-user price ($1,800) more than twice that of CERAMENT BVF, itself a premium priced bone void filler, in Europe ($822). They have shown strong European sales growth to-date as they significantly reduce hospital readmission rates due to surgical site infections, therefore avoiding the disproportionate costs of treating resulting complications. Bonesupport is in the process of securing specific coding for CERAMENT G and V in the major European markets which will clarify the reimbursement process and should provide a further boost to already solid sales. For example, the application for a Swiss procedure code (CHOP) has been filed, and the pathway and necessary study for French reimbursement (to obtain inclusion on the LPPR) has been recently confirmed. CERAMENT is scientifically differentiated from other synthetic bone substitute products; the objective is now to show how this translates to improved clinical outcomes over alternative bone void fillers. Broader appreciation of its bone remodelling and drug eluting capabilities, backed up by clinical data, will drive further CERAMENT sales growth and increase market penetration from the current low base. Supportive data (vs current standard of care, rather than simply other synthetic substitutes) will provide competitive differentiation, enable improved reimbursement and should result in increased CERAMENT adoption in a broad range of indications (including trauma, revision arthroplasty, osteomyelitis). Bonesupport is investing in studies to generate industry-leading data to expand the clinical evidence base and demonstrate CERAMENT’s clinical and health economic benefits to all stakeholders (surgeons, patients and payors). Near-term, results of the CERTiFy trauma trial (expected to read out by end-2018) should mark an infection point for the company. In tandem, Bonesupport is carrying out healthcare economics outcomes research to support improved reimbursement and market access. As in-patient orthopaedic products like CERAMENT are typically reimbursed via a bundled case payment, there is considerable potential to capture market share if a positive impact on hospital profitability can be demonstrated (eg reducing surgery time and hospital stays, faster recovery, and fewer revisions and hospital readmissions). Improved patient outcomes coupled with reduced treatment time, would enable more patients to be treated, improving hospital efficiency despite premium pricing. A significant post-marketing trial is underway in Europe (Exhibit 9). CERTiFy (CERAMENT Treatment of Fracture Defects), a 136-patient study across 20 German trauma centres (protocol published by Nusselt et al, Trials 2014, 15:75), provides an excellent example of how Bonesupport intends to use data to enhance its competitive position and drive penetration in certain segments. CERTiFy is comparing outcomes with CERAMENT BVF vs gold standard autologous iliac crest bone graft in tibial fractures. Enrolment completed in December 2017 and the study has a six month follow up period, thus top line results are expected H218. If CERAMENT BVF is shown to have equivalent benefits to autograft in repair of post-traumatic bone defects this, coupled to the need for only one surgical procedure vs two, would confirm that it is a highly competitive product. Positive data would support expanded use in trauma globally, and reimbursement negotiations in key regions (eg Germany). This should provide a near-term catalyst for sales growth, especially in the US as availability of this data should coincide with first sales from Bonesupport’s distributor network and provide impetus to regain lost share of voice. CERAMENT G and V are also being further evaluated in specific indications. One such example is a prospective cohort study in hip and knee arthroplasty revision comparing the incidence of periprosthetic joint infections (PJI) over one year following treatment with CERAMENT G or V vs a retrospective matched control at 6 centres in Italy (NCT03389646). PJIs, which occur in c1% of knee and hip arthroplasties, have a significant cost and patient morbidity burden but no standard treatment approach for prevention. Positive data from this trial would position CERAMENT G/V as effective prophylactic treatment options. A second example is a retrospective case series on patients with diabetic foot infections. Bonesupport also expect to begin enrolling a French chronic osteomyelitis study of CERAMENT G in 140 patients during 2018. Results are not expected for a few years but will provide level 1 clinical data to support reimbursement in France and in other countries. Bonesupport also intends to submit this data to the FDA as part of the CERAMENT G regulatory submission targeted for 2020. CERAMENT sales penetration by indication correlates with the available clinical data; it is highest in osteomyelitis. It has relatively low penetration in the large trauma segment, which is an area of focus for Bonesupport. 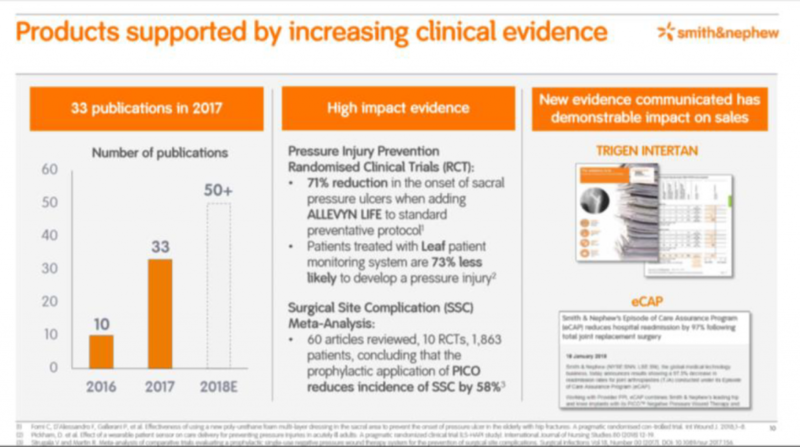 Ahead of CERTiFy data, the company has recruited speciality trauma reps in Europe to support general sales reps and leverage increasing data regarding bone remodelling and economic benefit of CERAMENT BVF in trauma with a push into this segment. CERTiFy is Bonesupport’s first large randomised prospective trial in trauma (tibial fracture) comparing CERAMENT BVF vs autograft. Non-inferiority of CERAMENT BVF would provide a significant boost to perception of the product and its use in trauma, as well as contributing to a compelling healthcare economic case for payers. The bone remodelling properties of CERAMENT, combined with similar (better) clinical outcomes to the current gold standard, at a cheaper cost and without associated disadvantages of autograft, would be a very attractive product for surgeons and hospitals. CERAMENT BVF is the most broadly available of Bonesupport’s products, representing 70% of global FY17 net sales. This percentage has declined from >75% in previous years due to the European success of the antibiotic-eluting products and the recent temporary hardware supply issues at Zimmer Biomet. However, its ongoing value to the franchise should not be overlooked. The US is the largest orthopaedic market globally, and with an average end-user price of $3,100 which is 2-3x higher than in Europe, US CERAMENT BVF sales are an important contributor to Bonesupport’s profitability. The commercial push into trauma, amplified by CERTiFy data, could have a material effect on CERAMENT BVF sales growth from 2018 onward. The data will also come at a time when Bonesupport will have established its own US distributor network, which will be motivated to return US sales of CERAMENT BVF to growth. CERAMENT BVF will be the only Bonesupport product available in the US until 2021, when CERAMENT G approval is anticipated. These three factors will underpin a sales acceleration. CERAMENT G and V, are the first CE marked commercially available antibiotic-eluting injectable bone graft substitutes. Together they represent c75% of European sales and are the primary driver of growth in that region (42.5% CAGR 2014-17). They have been shown to have a positive impact on the health economic burden, reducing the frequency of recurrent infection and need for repeat surgery across a range of indications including chronic osteomyelitis, PJIs in revision arthroplasty, fracture-associated infections, and diabetic foot infections. CERAMENT G and V have a dual mechanism of action, promoting bone formation and preventing recurrence through local delivery of an initially high and then sustained dose of antibiotic (Exhibit 10). Both products are the only true antibiotic eluting bone void fillers on the market; other products with eluting capabilities do not fully fill voids (eg pellet/bead versions leave gaps). Competing synthetic products are summarised in Exhibit 11 (overleaf) and largely fall into two categories: ceramics and acrylic resins (PMMA, MMA). These categories have distinct properties from one another and from CERAMENT G/V. PMMA and MMA are typically formulated as injectable antibiotic-loaded bone cements (ALBC) used in joint replacement and revision arthroplasty. Antibiotic release is through surface diffusion and may have a long sub-therapeutic release profile, with repercussions for bacterial resistance. Ceramics are primarily composed of calcium sulphate and available in pellet/bead format, so are not injectable nor do they completely fill bone voids with gaps left between beads. Neither the sole injectable product (Stimulan) nor the sole HA:calcium sulphate product (PerOssal) are pre-mixed with antibiotic, which is instead added at the time of implantation. CERAMENT G/V are injectable ceramics with bone remodelling and anti-infective properties. A 2017 review of published human data showed that CERAMENT G has a superior clinical profile to other ceramic antibiotic carriers, with lower infection recurrence and fracture incidence, as well as limited wound leakage in long bone osteomyelitis. CERAMENT G and V’s clinical profile, properties and format all provide differentiation that supports a premium price to CERAMENT BVF, making a positive contribution to Bonesupport’s margins. However, in some regions (ie France, Germany and Switzerland) it is not automatically reimbursed, instead being funded directly from hospital budgets until specific reimbursement coding is secured (Exhibit 12). Ongoing post-marketing trials of CERAMENT G and V will support reimbursement applications in some European countries. For example, in France, the chronic osteomyelitis trial will provide specific clinical evidence to support its inclusion the Liste des Produits et Prestations Remboursables (LPPR). Improved reimbursement should provide more impetus to CERAMENT G and V European sales growth, reinforcing its status as a key growth driver for Bonesupport. The fact that post-marketing trials are run by KOLs also provides endorsement of these products. Separately, CERAMENT G is under evaluation in the FORTIFY trial, discussed below, which is a requirement for FDA regulatory approval; a 2021 US launch is currently targeted. Presently, the only Bonesupport product available in the US is CERAMENT BVF, with North American distribution rights held by Zimmer Biomet (the number two orthopaedics company globally by revenue). This situation will change in H218 as Bonesupport takes a critical step on the path to achieving its goal of becoming a leading global orthobiologics company. In May, Bonesupport announced it had made the strategic decision to terminate the supply and distribution deal with Zimmer Biomet. From October, CERAMENT BVF will be sold through its own network of independent distributors in the important and growing US market. There are many advantages to Bonesupport taking direct control of US commercial operations now. Firstly, it gives the company ample lead time to build a high performance commercial platform ahead of planned launch of CERAMENT G in 2021. Secondly, this platform should take the brakes off CERAMENT BVF sales growth, generating more value for Bonesupport, through accelerating US sales (which have suffered over the past three quarters under Zimmer Biomet) and by retaining a higher margin. Lastly, Bonesupport intends to leverage the US distributor network by expanding its product offering with synergistic products (with osteogenic and/or osteoinductive properties) that will enable capture of a larger share of the overall US bone graft market. The practical aspects of Bonesupport’s plan are in motion. The size of the existing commercial team is being increased to 23 FTEs (by adding 9 new hires) and its capabilities broadened, in order to provide the necessary support and training to the new distributor network and drive a range of activities to expand market penetration. The distributor selection process is also underway; the target is to recruit and have the first 18 distributors active by end-2018. Independent distributors are the most common US sales model (outside of the 4 largest orthopaedics companies) so this is not uncharted territory. The criteria used by Bonesupport to shortlist its distributors (eg existing surgeon/hospital relationships; size and quality of sales rep teams; current product range and reach) support an expectation of increased sales. A key strategic goal for Bonesupport is winning greater market penetration of CERAMENT BVF across indications (trauma in particular); broad reach is important for the expanded portfolio too. CERAMENT BVF currently has strong usage and loyalty with key surgeons and opinion leaders. 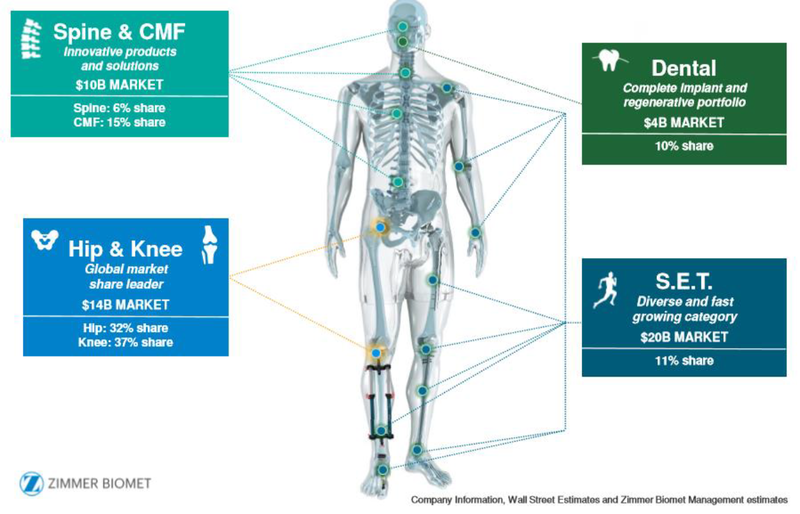 On a recent earnings call Bonesupport management confirmed that CERAMENT BVF in market sales increased by 7% in Q118; previously it emphasised growing uptake in some market segments such as foot and ankle (a fast-growing segment where Zimmer Biomet supply challenges are less acute) and in oncology (filling voids left after removal of bone cysts where CERAMENT’s radiopacity is advantageous). To provide context, the CERAMENT BVF sales and distribution deal with Zimmer Biomet was an exclusive multi-year rolling contract covering orthopaedics, trauma and foot and ankle indications. It was most recently renewed in March 2017. Zimmer Biomet holds the leading position in joint reconstruction (>30% market share in hips and knees, Exhibit 13), but is less well positioned in trauma, which along with spine, are key market segments for CERAMENT BVF. CERAMENT BVF is sold in conjunction with Zimmer Biomet hardware, hence US sales have suffered since H217 due to ongoing internal knee and hip manufacturing and supply issues at Zimmer Biomet. FY17 sales of CERAMENT BVF in the US only increased 13% y-o-y over FY16 with net sales of SEK78.1m. The decline began in Q317 (net sales down 8% on Q217 to SEK21.6m), with a further 42% decrease in Q417 to SEK12.6m. 2018 started more positively; Q118 US CERAMENT BVF net sales of SEK15.9m, were up 26% on Q417. However, this was 22% lower than in Q117, partly due to inventory build in the earlier quarter. Under Zimmer Biomet, uncertainty remains regarding when supply issues will normalise, that would allow full promotion of CERAMENT BVF to resume. The most recent update suggests that this could be by early-Q318; however, we expect sales to be impacted by any Zimmer Biomet plans to run down existing inventory prior to the end of their exclusive period on October 20. Additionally, we note that while CERAMENT BVF is marketed through a national network of 54 exclusive Zimmer Biomet distributors, sales are highly concentrated with 13 generating c70% of sales. Zimmer Biomet also markets other synthetic bone substitutes (including CopiOs, ProOsteon and Equivabone – the latter gained in the 2014 acquisition of Etex). 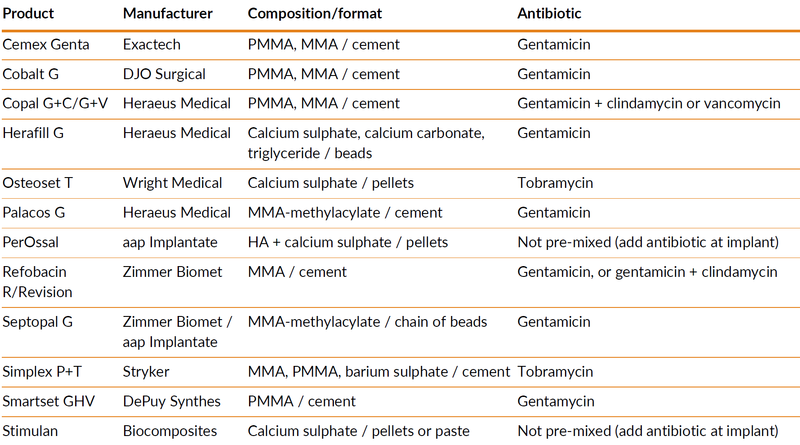 While these are differentiated from CERAMENT BVF in terms of composition and properties (ie not containing calcium sulphate), they could be deemed competitive in some indications. In absolute terms, Bonesupport will have a smaller distributor network, albeit with a more targeted focus, and motivated by commission-based incentives. Progress with sales penetration, both in terms of territories and indications, will determine when Bonesupport will expand its network from the initial 18, to up to 25 independent distributors. This commercial platform is the foundation on which Bonesupport intends to build an extended offering of marketed bone graft products. A broader product portfolio will transform the company into an orthobiologics provider, rather than a one-platform company, and improve its competitive positioning with healthcare group purchasing organisations (GPOs) and integrated delivery networks (IDNs). In the short-to-mid-term, Bonesupport plans to access and commercialise synergistic osteoinductive and/or osteogenic products alongside CERAMENT, as well as launching new CERAMENT formulations and CERAMENT BVF procedural delivery kits. The recently announced tie up with Collagen Matrix Inc is a pertinent example. The strategic agreement means Bonesupport can market and distribute selected bone graft substitute products from the Collagen Matrix range. These complementary products will be sold under the Bonesupport brand name and through its distribution channels, so helping to improve the competitive positioning with the larger payors (such as GPOs and IDNs). This deal can be implemented quickly, with the first products expected to be available for marketing later in 2018. We believe Bonesupport will continue to seek similar synergistic product opportunities to appropriately strengthen its commercial offering for its key geographic markets. These may be similar strategic collaborations and licensing deals, but we would not rule out product acquisitions if the appropriate opportunities were to present themselves. Conversely, Bonesupport’s growing global commercial presence from end-2018 should be more attractive to potential strategic partners that are the originators of its target products, rather than it being Europe only. Longer-term, this US commercial platform will be critical in communicating the value proposition of the CERAMENT drug-eluting portfolio, and will have developed a large customer base which are natural channels for CERAMENT G.
With strong European uptake, a premium price to CERAMENT BVF, and potential US approval in 2021 coupled with faster US adoption curves, CERAMENT G is an important medium-term growth driver for Bonesupport. 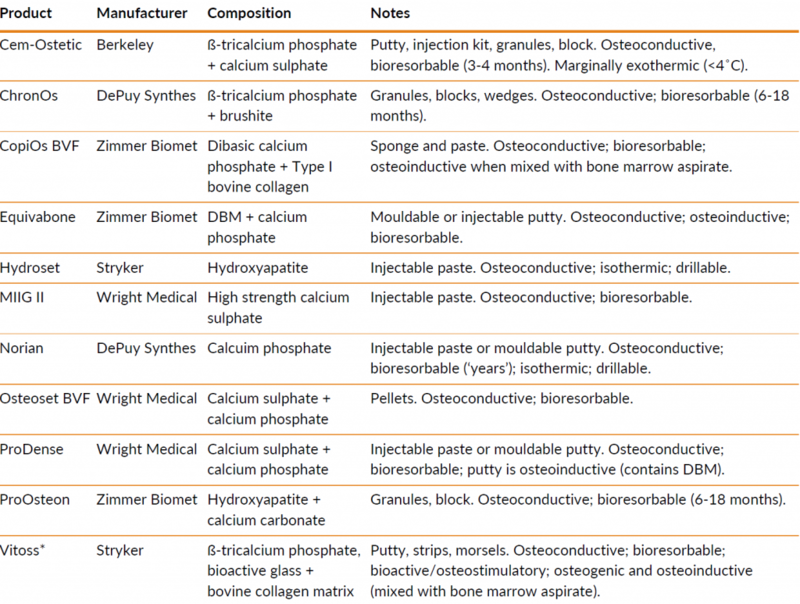 It has potential to become the first commercially available injectable ceramic antibiotic-eluting bone graft substitute in the US; as discussed previously, its clinical profile, properties and format all provide competitive differentiation. In the US, CERAMENT BVF is a Class II medical device approved through the 510(k) pathway (where a predicate device was already approved). Bonesupport is taking the more stringent device marketing route for CERAMENT G, seeking a Premarket Approval (PMA) which will result in its classification as a Class III device. A PMA submission includes safety and efficacy data from a randomised pivotal clinical trial, conducted under an Investigational Device Exemption (IDE), and this additional burden of proof provides a major competitive barrier. In August 2016, Bonesupport received FDA approval to initiate an IDE clinical study, FORTIFY (Exhibit 14); recruitment began in May 2017 and is enrolling to schedule. Data from FORTIFY is anticipated in 2020 and will form part of the submission of the final PMA module to the FDA. A broad label for CERAMENT G with a preferred indication was discussed with the FDA and accepted as part of the IDE application process; however, the final approved label will depend on the strength of the clinical data. Other supporting clinical data, such as from the French chronic osteomyelitis trial, is also likely to be submitted. The FDA should assess the application within 9 months, and assuming no advisory committee meeting is scheduled, approval is anticipated by 2021. The FORTIFY study has been designed to demonstrate efficacy of CERAMENT G in a complex, yet common, trauma indication. Positive data will provide proof of concept that prophylactic use as an add on to standard treatment can both improve and protect the bone healing process, remodelling bone to reduce the risk of fracture non-union and importantly minimising risk of deep infections. Such complications can lead to hospital readmissions. 30-day readmission rates are frequently used as a metric for quality of care as serious medical and surgical complications, requiring costly remedial treatment, are often associated with readmission. The increased cost of treatment coupled with potential penalties under the Hospital Readmission Reduction Program of the Affordable Care Act can have a significant impact on hospital profitability. A 2015 meta-analysis of 30 day readmission rates in orthopaedics showed that that across all procedures there was an average 5.4% readmission rate, with the most common reason being surgical site infection in about one-third of cases. The combination of improved patient outcomes and a lower cost burden would support CERAMENT G reimbursement (as an add-on to DRG) and a premium price in the US (a similar differential over BVF as in Europe would equate to $6000+), representing a significant commercial opportunity for Bonesupport. CERAMENT in combination with other bone healing substances. Recent progress with new CERAMENT formulations is evidenced by the recently announced acquisition of IP to a novel gelatin/CERAMENT biomaterial as a carrier for long-term sustained delivery of BMP and zoledronic acid; a first patent was filed in September 2017. This adds to its existing IP in this area, specifically the pending Case 13 patent family (extending to 2035) covering chemistry and combination of CERAMENT with BMP and zoledronic acid. A key area of focus is in exploiting CERAMENT’s drug eluting ability in developing a broad exploratory pipeline of novel osteoinductive products designed to enhance bone growth (Exhibit 15). These potentially first-in-class synthetic products are complementary to the current CERAMENT product range and could provide further differentiation, strengthening Bonesupport’s market position. The pipeline seeks to address high value orthopaedic segments where replacing and supporting poor quality bone is a significant unmet need, leveraging surgeon familiarity with the benefits and ease of use of CERAMENT by combining it with familiar and approved drugs. A synthetic product of this type with osteoinductive and osteoconductive properties could achieve higher reimbursement and pricing, should data confirm superior clinical outcomes. 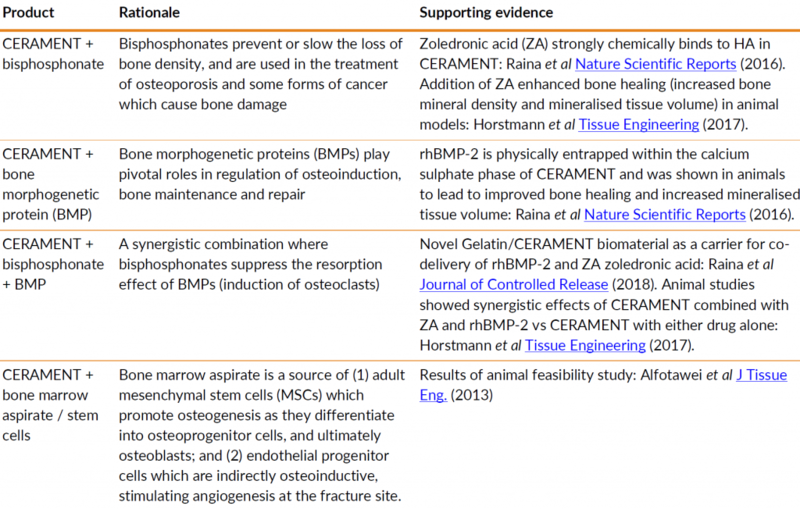 An example would be potential for local bisphosphonate (zoledronic acid) delivery to show a morbidity benefit (less skeletal weakness/fewer fragility fractures) over long-term systemic use. Bonesupport is exploring the feasibility of four potential products, generating preclinical data and obtaining intellectual property (IP) protection. Progress on these fronts, coupled with a commercial evaluation will inform the selection of two programmes to take forward into further development. The first of these is expected to enter the clinic in 2020. In common with most innovative healthcare companies Bonesupport’s three main sensitivities relate to clinical and regulatory aspects, commercial execution, and the financial resources required to accomplish these. Development risk is low as the CERAMENT platform is clinically and commercially validated; however, continued investment in sales/marketing and R&D (post-marketing and clinical studies) is required to facilitate ongoing global commercial execution. The core of the growth strategy is generation of clinical data and HEOR to provide competitive differentiation for the CERAMENT portfolio, support reimbursement and increase market penetration across various indications and geographies. Tied in with this, Bonesupport needs to ensure it makes the necessary investment in its commercial infrastructure to exploit these opportunities (and those presented by its broader future product portfolio) in a timely manner. Near-term, the key sensitivity is rate of CERAMENT BVF sales growth. In the US, this will be determined by the speed at which Bonesupport’s new distribution network becomes effective. Globally, CERTiFy data will impact trauma adoption. CERAMENT G is a European growth driver and could be in the US from 2021. Strong clinical outcomes data (specifically from FORTIFY) will determine its approvability, the US label and, separately, influence payer negotiations. Assuming approval, the latter factors may affect the rate of market acceptance and uptake, as well as defining the size and scope of CERAMENT G’s market opportunity. Other potential areas of sensitivity also include the manufacturing and supply chain and its capacity to support growth; potential for product liability claims; IP litigation/infringement potential; FX rates (the reporting currency is SEK with sales predominantly in USD or EUR); and funding requirements. CERAMENT’s extensive IP portfolio has over 100 issued or pending patents covering key technical characteristics in important markets, including composition of matter, formulation and device-related mechanical patents. Core granted patent families are B310 (mixing/injection device; to 2025 [Europe] and 2027 [US]) and Case 3 (iohexol inclusion; to 2022). Three pending patent families could extend protection to 2034. Equally importantly, Bonesupport has created other barriers to entry: significant production know-how (formulation, manufacturing); the trade marked brand; and a growing body of clinical evidence. 2017 IPO proceeds provide sufficient resources to execute on strategy to end-2020. However, if sales growth falls significantly below expectations, meaningful extra investment may be needed for trials or commercial infrastructure, and/or a sizable M&A opportunity arises, additional funds may be required. In summary, Bonesupport operates in a competitive, increasingly commoditised market. The company is seeking to differentiate its CERAMENT products through sustained investment in clinical trials and in marketing to raise the brand profile among its target audience and increase market penetration. With all players in the orthopaedics market facing continuing pricing pressures, and cost-containment measures being a focus area for hospital budgets, we believe these factors can only be mitigated by positive and meaningful clinical data that can support the cost effectiveness and value of new, premium priced products. As a commercial stage medtech, we value Bonesupport using a three-stage DCF methodology. Our valuation is based on explicit cash flows to 2022, followed by a ten-year trending period, and a 2.5% terminal growth rate. We forecast sales for all currently marketed CERAMENT products in Europe and the US, also including CERAMENT G in the US. For the latter we assume launch in 2021 and apply a 75% risk adjustment to recognise clinical and regulatory risk. Individual product rNPVs are summed and netted against the costs of running the business. Using this approach, Bonesupport is conservatively valued at SEK1,325m ($152m) or SEK26/share, with upside potential from successful execution. To illustrate this potential, removal of the risk adjustment on CERAMENT G (US) would lift our valuation to SEK1,439m ($165m) or SEK28/share. We also highlight that, at present, our valuation only considers CERAMENT BVF and CERAMENT G/V. The the addition of synergistic osteobiologic products to Bonesupport’s portfolio would represent valuation upside through increased revenues coupled with operational leverage. 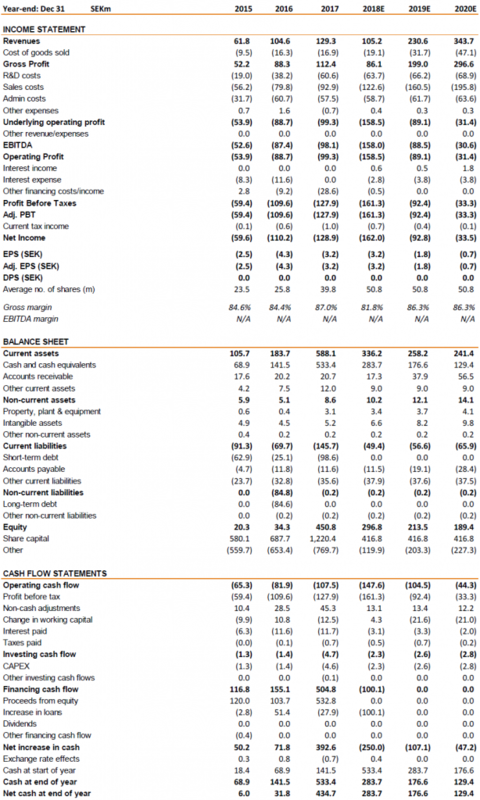 Exhibit 16 provides a detailed breakdown of the components of our valuation. We use a 12.5% discount rate to reflect the fact that Bonesupport is a small company operating in a highly competitive market; using a less conservative discount rate of 10% results in an increased valuation of SEK2,031m ($233m) or SEK40/share. 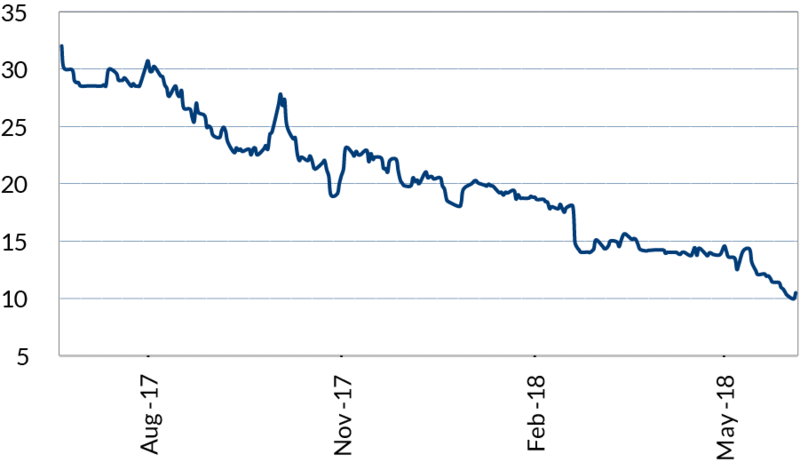 Bonesupport’s current share price is trading at post-IPO lows. Its listing price at IPO on the Nasdaq OMX Stockholm in June 2017 was SEK29/share. However, subsequent performance has been negatively impacted by the issues at Zimmer Biomet which have weighed on US CERAMENT BVF sales. Our model indicates that there is significant upside potential, with multiple catalysts in the next 6-24 months. These include: CERTiFy data and the anticipated US sales acceleration for CERAMENT BVF; and CERAMENT G data from FORTIFY and US PMA filing. Bonesupport’s cash position at end-March 2018 was SEK397m (SEK533m at end-2017; SEK141m at end-FY16) reflecting the successful IPO in June 2017. At IPO the company raised SEK516m net in equity; SEK500m gross (SEK461m net) through issuance of 17.2m shares at SEK29, with a further SEK55m raised in July 2017 from the exercise of the over-allotment option (exercise of an additional 2m shares). This strong cash balance enabled the company, in February 2018, to fully repay the €9.5m Kreos Capital loan secured in September 2016 as part of a SEK327m equity/debt financing round. It also provides sufficient runway to fund the necessary investments to execute on its growth strategy through to 2021 and become cash flow positive. Advance pipeline of two new product candidates: approximately 10%. In addition to the above priorities, management are confident that they have sufficient funds to expand their US commercial operations and build an independent distributor network. The transition to this new US sales model will increase costs (and weigh on profitability) in the near-term. However, from FY19 onwards, it should boost CERAMENT sales growth and margins, with the company reaching sustainable profitability in 2021 on our forecasts. On an annual basis, CERAMENT sales have shown continued growth. In FY17, net product sales were up 23.9% to SEK129.3m (FY16: SEK104.6m), with strong performance in Europe partially offset by weaker US sales growth as the impact of supply shortages of Zimmer Biomet products (sold with CERAMENT BVF) was felt. Bonesupport’s gross margin improved to 87% (vs c84% in prior years) reflecting higher growth of the more profitable CERAMENT G/V products in Europe. Q118 net product sales of SEK31.1m were slightly down on Q117 (SEK32.4m), albeit with a lower gross margin of 82% vs 89% for the prior period. The gross margin was impacted by three main factors: lower US sales (US pricing is at a premium to Europe/RoW); US product mix (smaller volumes represented a higher proportion of sales); and raw material write-offs. Europe/RoW FY17 net sales grew 43% (SEK51.2m vs SEK35.7m in FY16) driven by increasing adoption of the antibiotic-eluting products (51% y-on-y growth). SEK40.1m (78%) of total Europe/RoW net sales came from markets where Bonesupport sells direct, up 42% on FY16 (SEK28.3m). Q118 was a record quarter for Europe/RoW with net sales of SEK15.2m (Q117: SEK12.0m); sales of CERAMENT G/V accounted for c78% (SEK11.8m) of the regional total. In the US, FY17 net sales were SEK78.1m (+13% vs SEK68.9m in FY16); on a quarterly basis, US sales declined in both Q317 and Q417. Growth resumed in Q118 with sales of SEK15.9m, although this was down 22% on Q117 due to stocking in at Zimmer Biomet in the prior quarter. Exhibits 17 and 18 illustrate quarterly net sales progression on both a geographic and global basis. We expect FY18 CERAMENT sales to fall to SEK105.2, with continuing Europe/RoW growth offset by the impact of distribution changes in the US. We anticipate limited to zero re-ordering from Zimmer Biomet in Q318 as it runs down its inventory. From FY19, CERAMENT sales should return to growth (2017-20 CAGR of 27.7%) as Bonesupport’s new distributor network hits its stride supported by CERTiFy data, leading to an acceleration in global CERAMENT BVF sales (2017-20 CAGR of 23.6%). Part of this sales increase will be due to a change in the way in which Bonesupport reports US sales; under Zimmer Biomet, net sales of CERAMENT BVF are booked in Bonesupport’s P&L (c50% of end-user sales). From 20 October 2018, 100% of end-user US sales will be recorded as revenue, with distributor commissions included in sales and marketing costs. Over this same period, we expect continued traction in Europe with CERAMENT G/V sales (2017-20 CAGR of 36.0%), supporting an overall gross margin of c86%, ahead of potential CERAMENT G US launch in 2021. FY17 operating costs of SEK211.7m grew c20% due to increased investment in R&D (+59% to SEK60.6m, largely connected to CERTiFy and other post-marketing trials) and in strengthening the commercial infrastructure (sales expenses up 16% to SEK92.9m). Q118 operating spend was SEK58.7m, with growth in sales expenses (+11% on Q117 to SEK27.6m) driven by increased marketing activities and expansion of the US sales organisation. R&D costs rose (+58% to SEK14.8m) in connection with the FORTIFY study, while admin expenses were lower (down 24% to SEK16.5m) due to non-recurring IPO costs in Q117 and lower share-based compensation costs which offset the outgoing CEO’s severance pay. We expect a continued increase in R&D spend in FY18 (to SEK63.7m) as enrolment in the FORTIFY study ramps up and other studies are underway, offsetting lower CERTiFy costs as it nears completion. FY18 sales expenditure should increase meaningfully (to SEK122.6m) as both the US and European commercial infrastructure expands, and additional investments are made globally in marketing. Costs of transitioning to the new US sales model will include spend on increased headcount (+ 9 in 2018), a new Boston office, and non-recurring external consultancy fees. Increased investment widened the FY17 operating loss to SEK99.3m vs SEK88.7m in FY16. We expect a further significant increase to FY18 operating loss of SEK158.5m, before narrowing from FY19 onwards and achieving operating profitability in FY21. Bone Graft and Substitutes Market Analysis, Grand View Research October 2016 and Bone Graft Substitutes: Global Strategic Report, Global Industry Analysts Inc. April 2016. MediPoint: Bone Grafts & Substitutes – Global Analysis and Market Forecasts, GlobalData March 2017. Håkan Björklund Chairman Joined the board in December 2016, following the SEK 315m financing round led by Tellacq AB, a private investment firm in which he is an operating executive. Former CEO of Nycomed and Chairman of Lundbeck. Current Chairman of Acino International, Swedish Orphan Biovitrum, Trimb Holding, a Board member of Alere Inc and Colopast, and an Industry Executive at Avista Capital Partners. He holds a PhD in Neuroscience from Karolinska Institutet. Emil Billbäck CEO Joined as CEO in March 2018. He has over 20 years of management experience, with over 13 years in senior roles at BSN Medical. His most recent role was as a Senior Advisor at Essity following its acquisition of BSN Medical in 2017. Previously he was Executive Vice President EMEA and Head of Global Commercial Operations at BSN Medical and a member of the Group Executive Board/Management Committee, with earlier roles at BSN including Interim President of North America and Group Director Commercial Operations and R&D. He holds a BSc in Marketing and Economics from Karlstads Universitet. Björn Westberg CFO Joined in January 2017 as CFO. Previously CFO of global CMO Recipharm AB (2007-2016), CFO of software company Jeeves (2001-2007); and has held senior roles at AstraZeneca (including as Finance Director ISMO Northern Europe and Controller in AstraJapan). He holds an MSc in Industrial Engineering and Management from Lindköping University. Jerry Chang Executive VP, R&D Joined in September 2017. Previously VP of R&D at Zimmer Biomet Etex and Etex Corporation. 28+ years of industry experience in orthopaedic, wound management, regenerative medicine and biomaterials, with former roles with increasing responsibility at Dupont-Stolle Medisorb Drug Delivery, Bristol-Myers Squibb ConvaTec and Johnson & Johnson Ethicon BioSurgical. He received his PhD in Organic & Polymer Chemistry from the University of Cincinnati; and holds a BSc in Chemistry (Northeast Louisiana University).